Today marked the peaceful transition of power from one presidential administration to another. It did not, however, mark a making of peace in the United States between the fervently Trump and the fervently Clinton, or between the #NeverTrump and the #Setasideyourpersonalbeliefs #forthegoodofthecountry or whatever the opposite of a #NeverTrump would call themselves. And, it appears, it also didn't mark the understanding of the difference between a protester and a rioter, as far as I can tell. I did not watch the inauguration live - I chose to spend the day doing something enjoyable, rather than to spend it doing something I knew would be a frustrating, depressing exercise (at best). And, I admit, I was deeply fearful of what was going to happen. 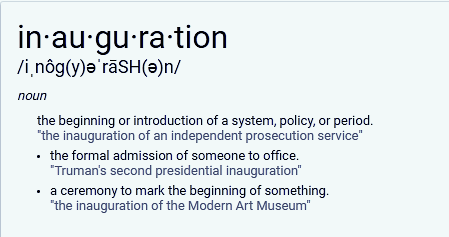 Not because of the promised protests, but because of comments from Tom Barrack, chair of the Presidential Inaugural Committee. What we've done instead of trying to surround it with what people consider A-listers is say what we're gonna surround it with is the soft sensuality of the place. So we have all of that, but it's in a much more poetic cadence than having a circus-like celebration that's a coronation, and that's the way this president-elect won. What happened instead? Several hundred thousand people showed up, a reasonable percentage of them participating in peaceful protest; a few dozen instigators performing acts of violence under the cover of the legitimate protests. In all, around 220 people were arrested at the last report I saw; six police officers were reportedly injured, where none should have been. Our future first lady displayed a perfect blue-collar coat today, and the new president delivered his American Carnage report in, I guess, a poetic cadence. Because carnage, doom and darkness remain this President's current vision of America; that has been constant since the convention in Cleveland. Here are excerpts of his address to the assembled dignitaries, Americans, and people of the world. For too long, a small group in our nation's capital has reaped the rewards of government while the people have borne the cost. Washington flourished, but the people did not share in its wealth. Politicians prospered, but the jobs left and the factories closed. The establishment protected itself but not the citizens of our country. Their victories have not been your victories. Their triumphs have not been your triumphs. And while they celebrated in our nation's capital, there was little to celebrate for struggling families all across our land. Remember, this is a message delivered by a billionaire who has his products made outside of the United States, whose daughter's company has her products made outside the United States, and who 'does deals' and develops properties around the world which are ridiculously out of reach for most people who voted for him. But that doesn't matter. At the center of this movement is a critical conviction, that a nation exists to serve its citizens. Americans want great schools for their children, safe neighborhoods for their families, and good jobs for themselves. These are just and reasonable demands of righteous people and a righteous public. But for too many of our citizens, a different reality exists: mothers and children trapped in poverty in our inner cities; rusted out factories scattered like tombstones across the landscape of our nation; an education system flush with cash, but which leaves our young and beautiful students deprived of all knowledge, and the crimes and the gangs and the drugs that have stolen too many lives and robbed our country of so much unrealized potential. This, from the man who hires foreign workers on special visas to make the beds and clean his properties and to make and serve drinks to the wealthy guests who go to them; who perhaps doesn't acknowledge that the country is almost at full employment; who ignores the fact that factories in the Rust Belt were replaced by factories in the Sun Belt paying employees much less than the factories they replaced; who, I think, honestly believes that anyone coming out of public school truly is "deprived of all knowledge" which is why he chose a public education foe to head the Education Department, and a man who, with the help of his multi-millionaire daughter, came up with a child care plan that if implemented the way it was presented, precludes single mothers trapped in poverty from benefiting from his child care tax credit plan. We assembled here today are issuing a new decree to be heard in every city, in every foreign capital, and in ever hall of power. From this day forward, a new vision will govern our land. From this day forward, it's going to be only America first, America first. Every decision on trade on taxes, on immigration, on foreign affairs will be made to benefit American workers and American families. We must protect our borders from the ravages of other countries making our products, stealing our companies and destroying our jobs. This, from the man who brought in billionaire Wall Street executives and billionaire businessmen, who, at the very least, come from the world where moving jobs overseas, or from north to south, or completely getting rid of them, or taking people's homes away is 'just doing business' we're told; some may have participated in these activities. Either way, while the wealth of the middle class has been ripped away, Trump cabinet members have not suffered anything remotely similar, nor has Trump himself, nor have any of his family members. Protection will lead to great prosperity and strength. I will fight for you with every breath in my body and I will never let you down. Winning is not everything. Winning at any cost is not winning. What, even, does this man think winning is? At the bedrock of our politics will be a total allegiance to the United States of America. and through our loyalty to our country, we will rediscover our loyalty to each other When you open your heart to patriotism, there is no room for prejudice. I'm not sure where the 'registries' fit into that loyalty to each other? We have seen, over and over during the campaign, how greatly divided we are between 'patriots' who wrap themselves in the flag and claim it as their own, nary a star nor a shred of stripe to share with anyone who is different: poor, or a person of color, or a person of a different religion, or a person of a different sexual or gender identity. A person who thinks differently, has different strongly held beliefs, or a different vision for our country. There is no room at the inn, so far, for anyone who does not agree with the Trumpian mantra of #MakeAmericaFillintheBlankAgain. Instead, there is prejudice in spades. Together, we will make American strong again. We will make America wealthy again. We will make America proud again. We will make America safe again. And yes, together we will make America great again. My middle-aged white lady perspective? America is about so much more than wealth, and having a giant military, and protectionism, and nativism, and marching in lockstep with each other and with our leaders. We are so much more than that. And I don't think this president has a clue. This is, in fact, the beginning or introduction of system, policy, or period. But is it the period of a president more blessed with natural gifts than any other before him? A man who will be so busy doing great things that he cannot take time to answer his critics? He is just a man, this president. Just a man - one who, if he worked for my employer, would have been fired any number of times for his prejudices, his proclamations, his attitude, his whole shtick. I remain #NeverTrump, and will continue to do so, until I have any sense that he is different from the person he presented to us all those months on the campaign trail, and all the weeks since he won the election. It is not time for me to abandon my beliefs and join him out of a sense of patriotic duty; the ball is in his court.